You are here: Home » GENRE » Fantasy » The City & The City: China Miéville’s fantasy novel hits the BBC. The City & The City: China Miéville’s fantasy novel hits the BBC. 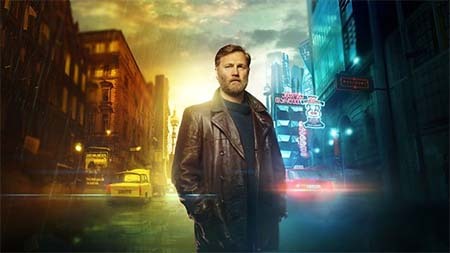 David Morrissey plays Inspector Tyador Borlú in BBC Two’s adaptation of China Miéville’s fantasy novel The City & The City this Spring 2018. 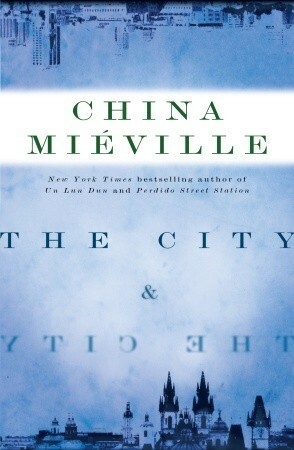 China Miéville originally published The City & The City back in 2009. The TV cast for the novel also includes Lara Pulver (Sherlock) as Borlú’s wife Katrynia, Mandeep Dhillon (Some Girls) as Constable Corwi of the Besźel Policzai, Maria Schrader (Deutschland 83) as Senior Detective Dhatt of the Ul Qoma Militsya, Ron Cook (Hot Fuzz) as Borlú’s superior Commissar Gadlem, Danny Webb (Humans) as hard-right nationalist politician Major Syedr, and Christian Camargo (Penny Dreadful) as Doctor Bowden, an American academic. When the body of a foreign student is discovered in the streets of the down-at-heel city of Besźel, it’s just another day’s work for Inspector Tyador Borlú of the Extreme Crime Squad (David Morrissey). But Tyador uncovers evidence that the murdered girl came from Ul Qoma, a city in a linked parallel reality with Besźel, and this case will challenge everything Borlú holds dear. David Morrissey interviewed about playing Tyador Borlú. “Eighteen months later I got sent the script with a letter from Tony and the director, Tom Shankland, saying we would love you to play the lead, Inspector Tyador Borlú, and when I read the script I thought it was fantastic. I still had big questions about how they were going to realise this strange and wonderful word that China had created. “Tom talked me through his ideas and concepts and his design board and photographs… I think he is a wonderful director and one I have wanted to work with for a long time and so I said yes. It was a real leap of faith but I loved the way Tom and his team have created these two worlds. “The concept is strange, it is a detective story told in this city, which is actually two cities that share the same footprint, but there are very strict regulations about the fact that one city cannot see the other city’s populace, they can’t look there, they can’t acknowledge them or interact with them and that creates all sorts of strange rules. Inside there is a secret police force called Breach and they are there to make sure that nobody breaks those laws of interacting between the cities. “In his own world he has a junior colleague, Corwi, played by Mandeep, and that is a great relationship. She is very ballsy, cheeky, you feel she is trying to get him to lighten up and crack a smile. She challenges his view of the world and he grows to be very fond of her. “The challenge was the schedule because I was in almost every scene. But that is what the crew have to do so you don’t moan you just get on with it. I really miss my colleagues and the working environment. On this project it was a really close-knit group of people and we all got on very well and I loved it. “There is a massive relevance… here is a story about one group of people living in a city who are denying the existence of another group of people living in the same city. The conceit is that what China has done is say that it is a different city completely but I think we don’t have to look too far in our major cities to see how people have ghettoised themselves or are living in gated communities and we walk passed people begging and sleeping on the streets and we have become blind to that. We see people in our very own streets living in terrible conditions and we have decided to ignore it and our eyes are turned down. Lara Pulver interviewed about playing Katrynia. 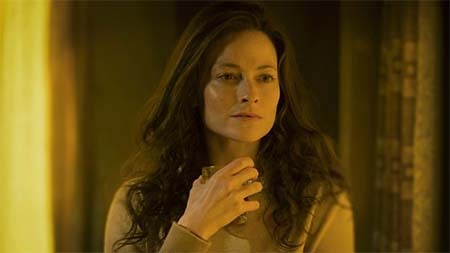 Lara Pulver reveals why she was drawn to the role of Borlú’s wife created especially for the TV adaptation of China Miéville’s novel, The City & The City. “When I first read the scripts I was fascinated by how multi-layered Katrynia is as a character, she doesn’t feel like the same person in any scene and that is a gift but also a real challenge too. We could do a scene four or five different ways in tone and tension because she is such an enigma that anything can work. She gave me the opportunity to really play as an actress because she is such a rainbow of personalities within one person. Lara explains how Katrynia’s inclusion in the drama helps to unveil this mysterious thriller. Paying this multi-faceted role wasn’t the only factor that made Lara want to be part of this project. “I desperately wanted to work with David Morrissey (Borlú) because I had just worked with Imelda Staunton in the award winning stage musical Gypsy and they are very much of the same wonderful school of talent, training and skill so I thought it would be such a gift to play opposite someone like David. He is phenomenal. Not only is he a brilliant and skilful actor, he is a lovely guy and he was in every scene, every day so it was exhausting for him and yet it never showed. “I also spoke with the director, Tom Shankland, and he had the clearest vision of something that is actually very complicated, especially when it comes to shooting the two different worlds of this drama and distinguishing those worlds and all of their characteristics in colour, tone, texture and style. Filming in Liverpool was an enjoyable experience for Lara because of her family connection to the city. Lara reveals there were some challenges that arose during filming. Lara tells us what she thinks makes this drama stand alone and why she believes audiences will enjoy it. Tony Grisoni has adapted this four-part fantasy series from China Miéville’s book in a production made by Mammoth Screen and directed by Tom Shankland (Les Misérables, House of Cards,The Missing). The City & The City (first trailer). « 2000AD Prog 2073 (e-mag review).